Primer: I literally wear primer every time I wear foundation because I feel that it wouldn't sit right on my skin otherwise. 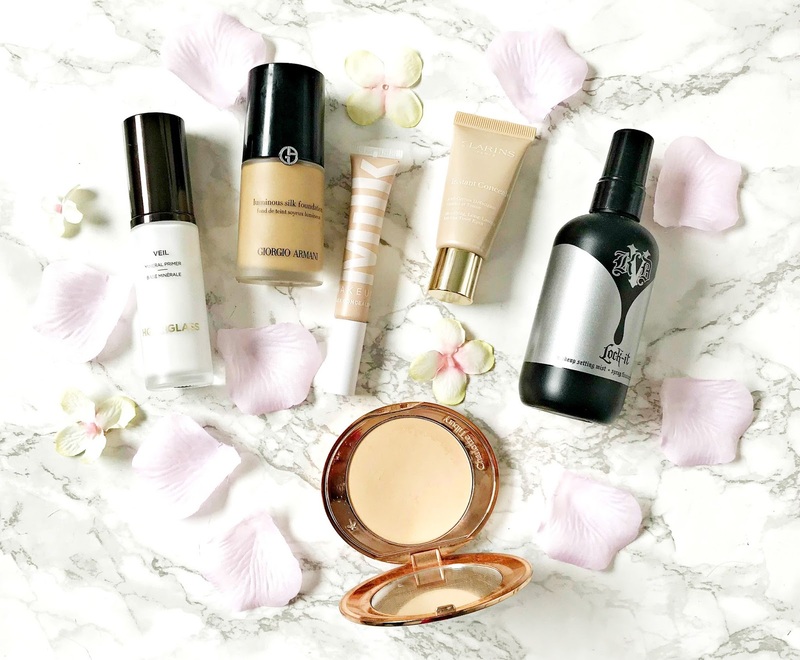 My skincare routine ensures that my skin is fresh and prepped for the next step so on the occasions that I need my base to really last, I reach for Hourglass Veil Mineral Primer. This product is lightweight in texture, yet it really smooths over the skin acting like polyfilla to create an even, poreless, flawless canvas for foundation. I also find that it really does extend the wear time of whichever foundation I use over it. It's expensive but a little goes a long way. P.S. Have you heard the exciting news that Hourglass is coming to Cult Beauty soon?! Foundation: My go-to foundation that I know I can depend on to look flawless and stay in place is Giorgio Armani Luminous Silk. I honestly couldn't hazard a guess on how many bottles of this I have gone through. It's not overly glowy but does have a certain amount of luminosity, it gives medium but buildable coverage and it doesn't highlight visible pores or fine lines. An all round winner in my eyes! Concealer: I have two brilliant concealers! The first is Clarins Instant Concealer, which really deserves more hype. This is seriously pigmented and banishes all signs of dark circles but it does so without being heavy or cakey on the skin - it's a pretty lightweight fluid texture so the bonus is that it doesn't settle into fine lines but it also doesn't crease. It can be used all over the face but my preference is for my under eye area. The second concealer is Milk Makeup Flex Concealer, which I've grown to really love the more I use it. It is a full coverage concealer so I really like to use it on areas of pigmentation or blemishes for long-lasting coverage. Powder: Because I have dry skin, I spent years avoiding powders because they basically aged me and made my skin look even drier but since receiving Charlotte Tilbury Airbrush Flawless Finish Powder for my birthday, I haven't looked back and am actually on my second one now! This powder lives up to its name entirely as it really does make the skin look airbrushed - blurring pores and creating a soft focus but without the traditional powdered look! Setting Spray: To finish things off and ensure that nothing budges, I always use a setting spray - usually I like ones that will also add some glow but when I want to ensure that my makeup stays in place, the best one is Kat Von D Lock It Makeup Setting Spray. This has a light mist action so it really doesn't disturb the products I have already applied and it literally locks everything in place, as the name suggests. It would be suitable for all skin types because it doesn't hydrate nor mattify - it just makes sure the base products don't move and does so without drying the skin at all. These are my dependable products but I'd love to hear what yours are?